Nowadays, more and more firms focus on core competencies and turn to external specialists (Third Party Logistics - 3PLs) for sophisticated logistics solutions. This research investigates the usage of 3PL services in the warehousing function by industrial firms operating in Greece. It focuses on three constructs (extent of use, decision making process, impact on user firms), which the authors believe are the primary determinants of the future usage on 3PL services in the warehousing function. The results, based on the analysis of data relating to 53 industrial firms operating in Greece, indicate that most users are satisfied with the service providers and believe that this has led to positive developments within the organization. With a high current level of satisfaction, a large number of these firms are likely to increase their usage of 3PL services. Supply chain management is recognized as a strategy for improving competitiveness by improving customer value and reducing cost (Mentzer, 2004). The logistics function is key for supporting supply chain integration and facilitating the flow of goods from producer to the final consumer (Arroyo, Gaytan & de Boer, 2006). At the same time, fewer resources are available to logistics because of corporate goals regarding downsizing and short-term profit improvement. 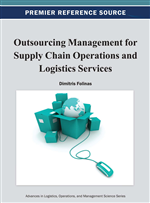 To achieve the corporate demands being placed on logistics with fewer resources available, outsourcing of logistics activities is being utilized (Bardi & Tracey, 1991). In the 1980s, many transportation and warehousing firms have developed into 3PL providers (e.g. Exel Logistics and Frans Maas). In the early 1990s, firms that specialize in express parcel deliveries entered the market (e.g. DHL, TNT, UPS and FedEx). In the late 1990s, companies originally specializing in financial services, IT services and management consulting entered the market by developing competencies in information systems and supply chain planning (e.g. Andersen Consulting). Given the growing importance of logistics outsourcing, the extent of its usage has been widely examined (Arroyo, Gaytan & de Boer, 2006; Bhatnagar, Sohal & Millen, 1999; Dapiran, Lieb, Millen & Sohal, 1996; de Koster & Warffemius, 2005; Hong, Chin & Liu, 2004; Lieb & Bentz, 2005; Maltz, 1994; Razzaque & Sheng, 1998; Sankaran, Mun & Charman, 2002; Selviaridis & Spring, 2007; Sohail & Sohal, 2003; van Laarhoven, Berglund & Peters, 2000). The majority of these studies indicate that warehousing and transportation are the logistics functions most frequently outsourced as well as that firms are generally satisfied with the services of 3PL service providers. In Greece, there are a number of studies and commercial surveys regarding the outsourcing of logistics services (Dinos, 2003; Giannakainas, 2001; Laios, 2004; Lazaropoulos, 2011; Moschuris & Apergi, 2006; Moschuris & Chatziioannidis, 2002; Papavasiliou, 2002; Vegiazi, 2008; Vouxaras & Folinas, 2010). The vast majority of these sources is theoretical in nature and indicates that an increasing number of Greek firms are choosing to outsource some logistics activities, and more frequently transportation and warehousing. However, to our knowledge, we have not found any comprehensive studies reported in the literature focusing on the outsourcing of warehousing by firms operating in Greece. We believe that a study on outsourcing of the warehousing can provide information that will assist the logistics/ warehousing manager in making a decision concerning use of this concept. This study aims to fill this gap.